It’s all been said before, and it will all be said again. The world of information security compliance feels like being a castaway in a bowl of alphabet soup. However, with a compliance tracking tool roadmap, risk management and compliance management become a strategic journey rather than being adrift, alone in the sea of letters. If you think of compliance as your final destination, the process of planning your trip there becomes much more relaxed. What is a compliance tracking tool? With the current plethora of industry standard and regulatory compliance requirements, many organizations are turning to software solutions to automate their compliance activities. Compliance management software enables you to aggregate all your documentation supporting your security first compliance approach to prove your continuous auditing stance. In short, the software makes it easier for you to show auditors that you’re keeping information secure and eases the audit burden underlying compliance. 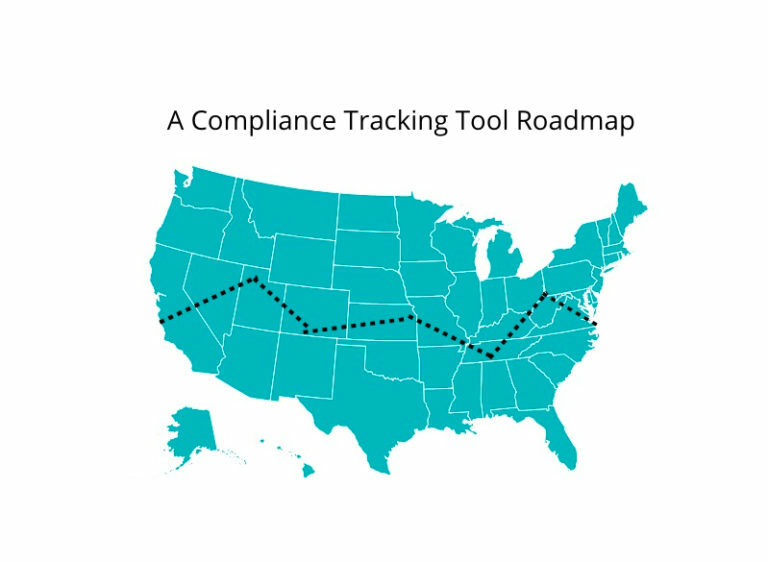 If you think about compliance as a road trip, then your compliance tracking tool is the management system that collects and stores all your travel plans. The first step to getting to compliant lies in thinking about the different paths you want to take. Just like a cross-country road trip, you already know your destination. If you’re in the healthcare industry, you want to be HIPAA compliant. If you’re in the retail sector, you want to be PCI DSS compliant. Similar to a road trip, the road to compliance requires you to look at the different paths you can take to get there. When you map out a road trip, you’re most likely looking to decide what highways have fewer tolls. Compliance, however, works oppositely. You need to determine what laws and industry standards are the most financially risky to protect your company financially. HIPAA, for example, comes with some hefty fines and penalties. PCI DSS compliance also incorporates excessive fines and penalties. Meanwhile, ISO and NIST compliance are often leveraged to gain customer confidence rather than as a regulatory requirement with penalties. If your business needs to be compliant to regulations or standards that can penalize you, you probably want to start there. On a cross-country journey, you’re not going to drive straight from one end to the other. You’re going to plan stops based on the risk of hunger or sleep deprivation. Compliance risk management requires you to prepare stops, or controls, based on unauthorized risk to protected data. Start with the types of data you collect, store, and transmit. While you should maintain the integrity, confidentiality, and accessibility of all information, protected information is a higher compliance risk. Review the locations and devices that collect, store, and transmit data. Many compliance requirements prescriptively tell you the controls you need to use. Determine whether the locations and devices secure their data and how they ensure no unauthorized users can access it. Once you know your risks, you can plan how to address them. This is where you map out your stops, just like you would if you were driving a long distance. Find potential points of entry. These can be devices, networks, or systems that access your data. You need to review how someone can gain unauthorized access. Set controls. Locking down these points of entry can include protections such as encryption methods, firewalls, network segmentation, or passcode requirements. Establish policies and procedures for ensuring ongoing control effectiveness. Just like watching your gas mileage to measure cost, you need to set metrics surrounding your compliance efforts. Time since your last data breach. The time it takes you to find a data breach. The time it takes you to control the data breach. Number of times your system been unavailable. The time it takes you to get your system back to normal. The number of critical systems you have patched for security updates. The number of networks you configured according to standards. If you’re using GPS on a road trip, you’re looking at the different traffic patterns to make good time. Continuously monitoring your data environment in real-time is the same thing. Review alerts. Make sure to check for security alerts and update systems accordingly. If you see something, say something. Whether it’s a phishing email or browsers taking too long to load web pages, make sure your employees know to report it. Install malware and ransomware software that updates regularly. You might not be able to catch a web application virus, but you can try to protect against it infecting your systems, software, and devices. When you go on a road trip, people who live somewhere might tell you the “must see” and “must do” stops. As such, you often add things to your trip that you didn’t plan to do. Compliance standards and requirements are the same since some expect specific controls. Look at the standards and regulations you want to which you want to align. Compare the controls you have and the ones they require. You’re typically not going on a trip without telling people where you are or telling those with you where they’re going. The same is true of compliance. Compliance isn’t just a set “policies and leave them” process. There’s a reason it’s referred to as “GRC” with the “G” meaning “governance.” Governance means telling internal stakeholders what’s happening and how well you’re doing. Make sure that your board knows and understands the risks, controls, and any security incidents that have occurred. Talk to internal stakeholders from different departments. Work with different departments to make sure that they have common vendor management procedures in place. Planning your compliance program, like planning your trip, takes time and organization. With all the documentation and conversation necessary for a robust cybersecurity program, many companies are choosing to automate compliance. ZenGRC’s platform enables continuous monitoring with real-time visibility into your current compliance posture. Our compliance dashboards allow you to aggregate all your documentation for a “single source of truth” while also enabling workflow tagging and task prioritization to ease information sharing with internal stakeholders. Read our compliance tool roadmap for more information about how to plan your program.